Our first priority is that we collect blankets, bedding, towels, tablecloths, clothing, fabric, yarn and shoes to poor children and adults in Eastern Europe. We sort the fabrics and provide our partners, that already have networks in the recipient countries, with what we have collected. This is the most effective way for us to distribute clothes and blankets to the end user. Currently, our main partner is www.mug.no. Clothing and fabrics with stains and holes we cut, and make blankets and pillows with the pieces. In this way, we use most of what is collected. With the yarn we get, our volunteers knit warm fuzzy socks, hats or scarves. If we get something that we can not send to Eastern Europe, such as toys, throw pillows, kitchen stuff etc, we give it to Romerike Shelter. And then they give the things to women and children who are destitute and in need of everything. 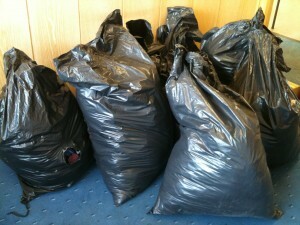 First we take the clothes to our offices at Furuset. Here we sort, put in plastic bags and then brands the bags. When MUG has the plastic bags they are placed in cardboard containers, which then are placed in large containers. These are taken from Larvik to Rotterdam. In Rotterdam there is a center that gets orders from the recipient countries. It will, for example, say an orphanage in Moldova can ask Rotterdam for shoes, if that is what the need is. This is then transported from Rotterdam to Moldova if it is in stock. Encouragement: We who live in Norway, the world’s richest country, has every opportunity to never allow these stock houses to be empty. Join us to meet the needs that exist in Eastern Europe!